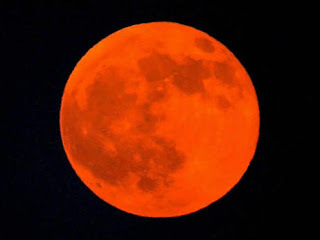 Once in a red moon, your flaws work in your favor. Last night was one of those times. My tendency to randomly wake up throughout the night, (an annoyance at best, a sleeping handicap at worst), woke me up just in time to see the total eclipse of the moon. I was particularly pleased by this because I had read that the moon would not just disappear, it would actually turn red, an effect of the sun's light being strained through the earth's atmosphere. Source: NPR- The moon appears red during a lunar eclipse in the Qatari capital of Doha, 28 August 2007. It's going to happen again tonight, and be visible across North America. So I clumsily rolled out of bed and walked out into the hallway to find a window where this sight would be visible. (I wasn't so dedicated as to go out in the freezing cold at 2:30 am). However, my effort was rewarded! The eclipse was fabulous! I did indeed turn a shade of reddish orange, not quite as dramatic as the picture in this NPR article (above)... at least not in the minutes when I was watching. Regardless, it was worth the temporary loss of sleep. Thank you insomnia! Anyone else see the eclipse last night, perhaps even from outside?? his voice much louder than a knock. A Thursday night in December? No more than 20 degrees? What are still those people thinking? "Oh, it's just a coldish breeze." I wonder what the occasion? Is it perhaps an engagement party? or just a messy blur. that doesn't seem quite right. in the place where you abide. Sleeping is my only to-do. In conclusion: All you drunkards, those blurry brown things are buildings with people living in them, please be respectful. Thank you. If you haven't seen my revised D.C. List, you should check it out. Not only have I created new, fun and relatively odd photos for each category, I am now up to 350 things, only 15 shy of the total. 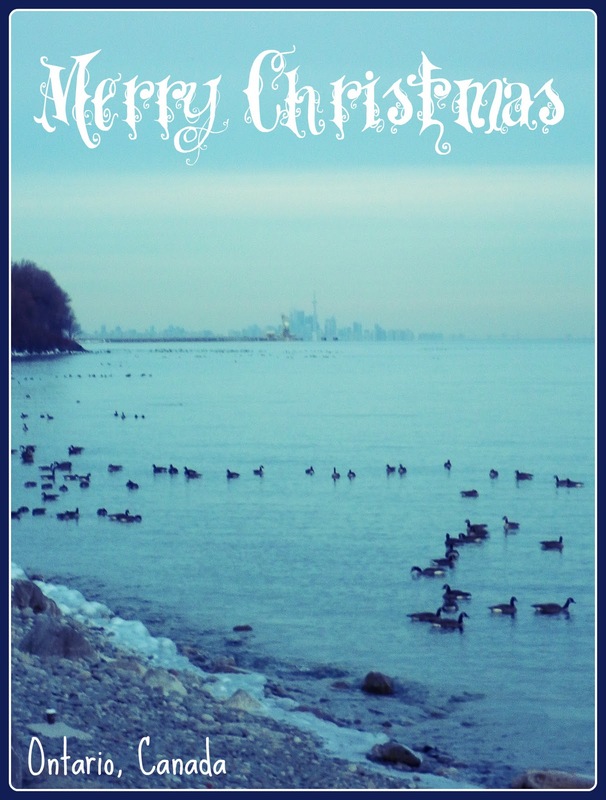 You'll notice I have also crossed another tranche of these activities, and I have created a new section for Holiday activities, as cities tend to redefine themselves when the season changes: a seasonal make-over if you will. You have already seen some of my winter outings, such as the Holiday market and Norman Rockwell exhibit. However, this weekend was a blowout of other seasonal offerings. Beautiful outdoor decorations. Unfortunately, a below-par camera. You'll have to wait until I pillage my friend's photos to see them properly. do you think you can see this from space? Of course, we had to go see the National Tree. Thankfully, it is bright (more like electric neon) enough not to need a flash despite it being nighttime. White House beyond the glow of the tree. Throughout the day, we saw random Santa Clauses, Reindeer and Elves parading the streets, shops and even clubs of D.C. Aside from a general outpouring of Christmas spirit, we never did figure out the direct motivation behind all these suits. A roof-top, HEATED, bar at Local 16, a new favorite of mine now, for many reasons including its great happy hour prices ($5 mango martinis), innovative Harvest pizza (butternut squash and caramelized onions), its ample space and friendly staff. I already know that this is somewhere I want to hang out in the summer when the heaters disappear and the rooftop opens up to the world. No photos of my own. You'll have to go here to see what I mean. 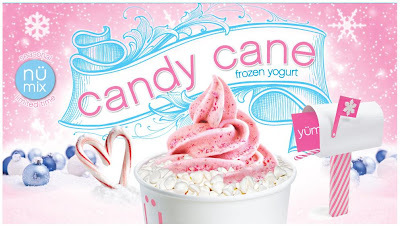 Not making it back to Yogen Fruz for the limited time, holiday flavor: Candy Cane and White Chocolate. How amazing does this look, even if you are not a Mint-nut like me! Geneva, Switzerland hosts the headquarters of numerous large international organizations such as the United Nations and the International Red Cross. It is also the headquarters of the GAVI Alliance, an organization dedicated to saving children's lives and protecting people's health by increasing access to immunization in poor countries. 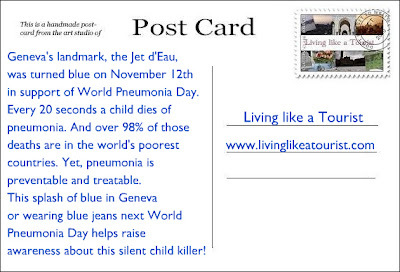 GAVI was a co-founder of World Pneumonia Day which, as you saw on the postcard, raises awareness and funds for preventing the millions of avoidable deaths caused every year by pneumonia. 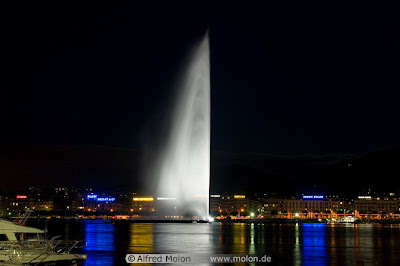 Geneva is known for many things: peace treaties, Palais des Nations (U.N. HQ), watches, fondue, nearby skiing, but its iconic landmark is the Jet d'Eau. Originally built in 1886 as a safety valve for a hydraulic network, this fountain was recognized for its aesthetic appeal and moved to its present location in 1951. 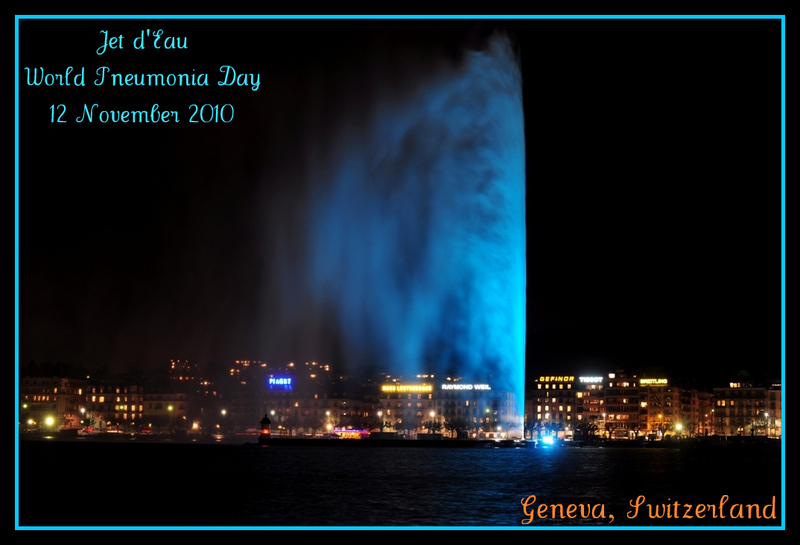 Since 2003, the fountain runs every day, and the water reaches a remarkable 460 feet (140 meters)! Turning the icon of Geneva blue in solidarity with the campaign surely grabbed the attention of city residents, tourists and perhaps even airline passengers (it can even be seen from the 33,000 feet in the air! ), and hopefully brought to light the needless deaths of pneumonia victims. The end of a week, which involved an impromptu business trip, a tornado-caused flight diversion to Alabama, a lot of down-to-the-last-minute deadlines and a lot of unexplainable reminiscing, called for some silliness. And that is what Rocket Bar offers. A neon sign is the only suggestion of this underground playland in Chinatown. I was particularly allured and amused by the skeeball machines, a fond memory of my youth, but the darts game was also fun and took up a little more time (and perhaps skill). Holiday busyness is unavoidable, no matter how much you try to dodge it or plan in advance. The streets are busier, the public transportation is fuller, and the grocery stores are disastrous. I won't even mention malls. So, like it or not, this commotion seeps into every day life. That is why I like holiday-specific activities. Then the busyness is warranted. The Holiday Market in Penn Quarter amply fits this descitpion. Small but creative with its vendors and crowded as it is, it is a good place to find unique gifts. And, should you see that the Stacy Brooks band is playing there again (or anywhere else for that matter), I highly suggest going. Her booming voice is remarkable and her rendition of "I'd Rather go Blind" (a favorite of mine), was enough to have us sit down and listen despite the 30 degree blistering cold and the distance from an outdoor heater. I also finally made it to the Norman Rockwell exhibit at the American Art Museum with only a few weeks to spare. It ends on January 2. The hearty exhibit from George Lucas's and Steven Steilberg's collections was fabulous. It showed a vast array of Norman Rockwell's different works from paintings he did as advertisements to ones honoring various people like the Boy Scouts or Charles Lindbergh. The one above was definitely one of my favorites: clever, innocent and telling. Rockwell was able to capture emotions like no other and the exhibit's title "Telling Stories" is dead-on. He was a master. I couldn't help notice how a smile would suddenly come across my face as I walked up to a painting of a terrified kid peering over a diving board or a beautiful woman being taunted by two overly keen truck drivers. Looking around me, I noticed that I wasn't the only one with this reaction. If you need a reason to smile, visit this exhibit or if you are not in D.C., preview it here... The stress of the week quickly melted away after all.